The Gray Iron Fitness Newsletter, Issue #131, The fitness lifestyle: Is it worth it? The fitness lifestyle: is it worth it? My doctor, normally a cheerful person, seemed somewhat subdued at a recent appointment. So I asked how things were going. She told me that a good friend and medical school classmate was just diagnosed with lung cancer. He is only 40 years old, and he never smoked. When I mentioned this later to a friend, he said, “That’s just as I have always believed. You can avoid health hazards and be struck down anyway. So why not smoke if you enjoy it?” There’s some twisted logic there; but he is right about one thing: Regardless of having good health habits, there is no absolute guarantee of a long, disease free life. There are only good odds and bad odds. Our neighbors were kind and helpful. But, surprising to me, some told us they never bother locking their doors or taking precautions when they leave. “If burglars want to get in, they will,” one said. “So why bother?” I agree that some thieves, if determined enough, will get in no matter what precautions are taken. There are only good odds and bad odds. When I was younger and feistier, I would debate with people about dietary practices. Their arguments with the “health nut” usually included having a relative or acquaintance who smoked a pack a day, boozed it up a lot, and yet lived a long time. They didn't want to hear about Jack LaLanne. 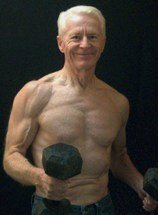 But they liked the story of Jim Fixx, a well-known fitness buff and author who checked out fairly early in life. Yes, it does happen. There are no guarantees. There are only good odds and bad odds. The good odds are that your lifespan and, more importantly, your health span will be longer if you live a fitness lifestyle. Smoke, booze it up a lot, get fat, and/or use drugs, and the odds greatly favor the onset of diseases brought on by self-destructive habits. Go with the good odds and take care of yourself. The good odds are that you will feel better throughout your lifetime and you will last longer. There is plenty in life that is exciting and rewarding without abusing oneself. P.S. Lock your doors, too. It won’t stop every thief out there; but it will cull the criminal herd. Most of them look for the easiest entries. Unsecured doors and windows are like putting out the welcome mat. P.P.S. The burglar who harmed our dog was caught sometime later. A homeowner returned while the burglary was in progress. The thief ran through a neighborhood and hid in a compost bin. He had abused our dog and it was a dog from the police K-9 unit that sniffed him out. That’s poetic justice. While on the subject of thieves, a terrific story of one getting his comeuppance happened New Years Day in Tucson, Arizona. A weightlifting grandmother of six turned the tables on a mugger, and it made the ABC Evening News. Read about how she stays strong and in shape in this Gray Iron Fitness interview.